(L-R) Jerome Perils, Kenako Concrete MD alongside Sadick Davids, CDC business development manager - Metal and Manufacturing. 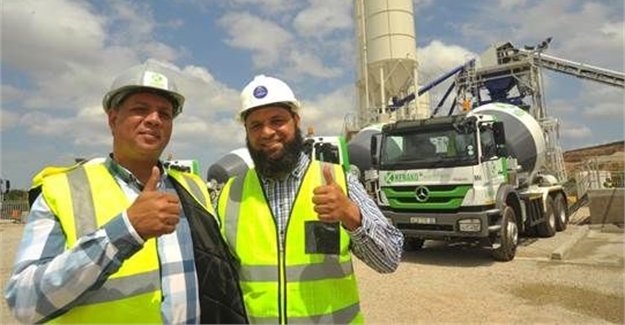 The R71m Kenako Concrete manufacturing facility, located in the Coega Special Economic Zone (SEZ), is the first black industrialist in Port Elizabeth to be funded by the Department of Trade and Industry (dti) and the Industrial Development Corporation (IDC). The facility has the capacity of six cubic metres of concrete in four minutes and 150m3 in an hour. The plant also produces retarded mortar, plaster and topping. “The project as a whole is a year and a half in the making. There was a lot of hard work, but I managed to get onto the dti’s Black Industrialist Programme, and the IDC along with the Treasury, are now the funders of this project. It is very satisfying to see the plant up and running,” says Jerome Perils, Kenako Concrete managing director. “During our first month of operation, we have hit the ground running as we are currently serving 30 accounts with the capacity to double that,” adds Perils. Furthermore, following the challenges pertaining to the water situation in the Nelson Mandela Bay, the facility is one of the few “green” operations, with the water used to clean its trucks being recycled back into the plant for concrete manufacturing.